Indira Nehru (1937) was the daughter of Jawaharlal Nehru, a major figure in the Indian independence movement and the first Prime Minister of Independent India. Educated in India, Switzerland and England, she came up to Somerville in 1937 (soon after her mother’s death) to read Modern History. She did not finish her degree due to ill health but while she was here she established lifelong friendships as well as important political contacts. She returned to India in 1941 and married Feroze Gandhi in 1942. During the long prime ministership of her father (1947-64), she acted as his official host and assistant, and began to flourish as a politician in her own right. 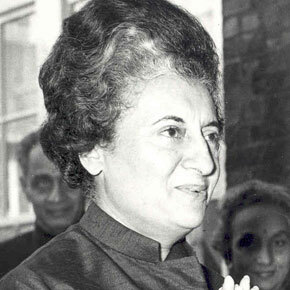 In 1966, as leader of the Congress Party, she was elected Prime Minister. She won three consecutive terms of office steering the country through the war with Pakistan and the declaration of Bangladesh’s independence. She lost power in 1977 following a period of highly controversial emergency rule in 1975. Her party won the election of 1980 and she became Prime Minister for a fourth term. In June 1984 however, a violent clash with Sikhs at the Golden Temple caused increased anti-Gandhi feeling and on 31 October 1984, two of Gandhi’s Sikh bodyguards assassinated her in the grounds of her home.